1. From the front edge of the bench to the face of the target: 25 or 50 yards. 3. Weight: There is no limit on weight of the rifle or pistol. 4. Sights: There are no restrictions on scope power. 5. Iron sights with aperture rear and globe front can be used. 6. Diopter attachments can be used in iron sights. 7. Triggers can be adjusted to a light pull, but must be safe. 8. 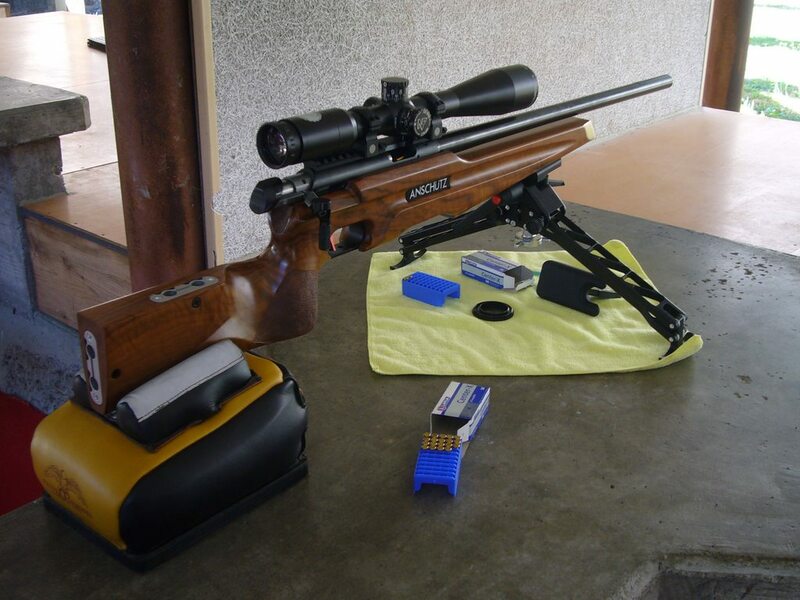 Ammunition must be Rimfire: .22 Magnum and .17 HMR are allowed. 9. Rests: Shoot over sandbags, shot bags, rice bags or any old bag. Use a tripod, bipod, a block of wood or a rock for your front rest. A bunny ear or rabbit ear sandbag is recommended for buttstock support. Shoot from a bench. Shoot prone with a sling or over sandbags. Shoot over a log or the hood of your pickup if you want. One piece rests are allowed. 10. You can shoot up to four targets and report the best of the four. 11. You can shoot more than one rifle each month: Not more that four targets per rifle. 12. You can shoot on an indoor range from January to March. If you shoot indoors in January through March, type (INDOORS) at the beginning of the third line of your score report. 13. Junior Shooters: The minimum age of a young person allowed in these competitions will be determined by the parent. A Junior shooter is a young persons who has not reached the age of 18. If you are a Junior: Type (Age 14): Or whatever your age, at the end of the second line of your score report. 16. 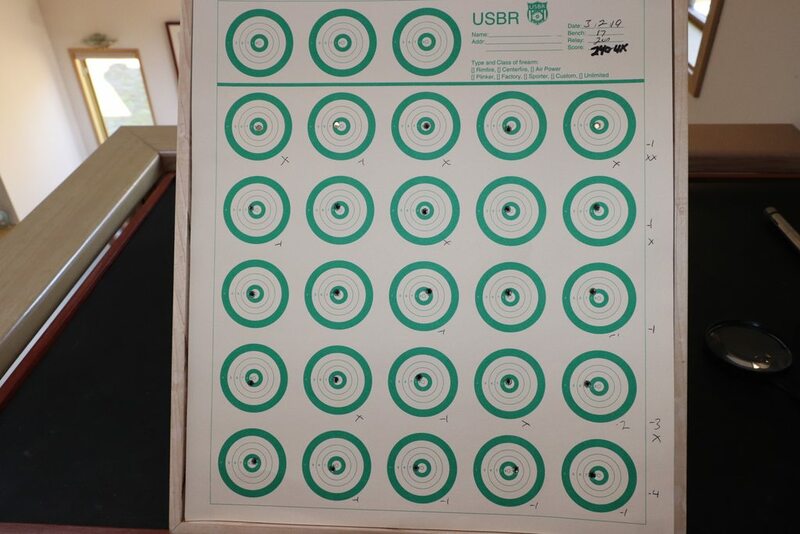 On the first line of your post, list the range (25 yd or 50 yd) that you are shooting. Custom. B&L 6-24X. Lapua Midas L.
Hall action. Lilja barrel. Jewell trigger. McMillan stock. Overcast sky. Gusts to 15 mph. Wind flags lied to me. Suhl 150. Weaver T-36 with 1/8” dot. Overcast sky. Gusts 10 to 15 mph. Shot the 5th match of the season today in sunny, cold (35°), and breezy conditions with the wind picking up even more on the second target. Shot a 242-6X for the win in the first match, and then shot a 240-4X which I thought would be good for another win considering the wind. One of our older shooters (a wily older very experienced rimfire shooter), pulled out a 245-4X for the win. I shoot with some really good shooters, especially considering we shoot off bi-pods, and without tuners. Again, rife pictured as shot. Factory Action, Stock, and Barrel (Hunter Chamber). No Tuner. Shot using a Bi-Pod, and a Protector Rear Bag. Sunny 35° - In ever increasing moderate winds. Last edited by Smoothtrigger; 03-02-2019 at 04:21 PM. I've been following this competition all winter. Understandably, participation is light because of winter. I'm in Iowa and temps are currently in the single digits for highs with wind chills below zero. Can't wait for spring so I can participate. Please keep this completition going! Last edited by Sod Farmer; 03-06-2019 at 01:22 PM. Thought I would try and shoot a target for March. Decent weather. Was trying out a new lot of ammo from recent purchase. New lot didn't seem to be quite as good as the last lot I shot. Had to make a slight tuner adj. Didn't shot as good as last month will try again next week. Will be getting some more new ammo. Thought I would include some photos this month.